Dentures are false teeth made out of plastic which are used to replace missing teeth. If all teeth need to be replaced, a complete set of dentures are necessary. 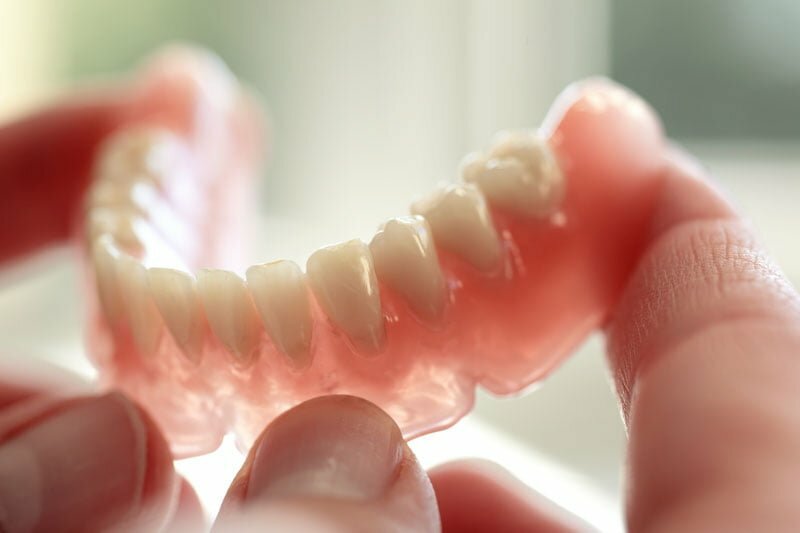 There are different types and materials that dentures are made out of. Examples include Totally Natural Teeth (TNT) or conventional acrylic dentures. Your dentist will work closely with you to make sure you are given what suits your needs and satisfies your comfort level. They rest on the tissue that covers the bone of upper and lower jaw. These dentures are created and customized by the dentist. Your dentist will take multiple appointments to do the proper adjustment, fitting, impressions and registration of your bite. Afterwards your dentist will select the right size, shape and shade of teeth that best fits and is customized to your needs to get you as close as you were to your natural dentition. What should I expect on my denture appointment? During the first appointment, your dentist will evaluate if you are a good candidate for complete dentures by assessing the amount of bone via Panoramic X-ray and visual examination. Your dentist will take impressions and will send to laboratory for fabrication of custom trays. These trays are custom made for the patient and will allow the denture base to be perfectly molded around the bone and tissue. Your dentist will take another impression using the custom trays and special denture materials for the denture base. Another appointment will be committed to measuring the vertical dimension of occlusion to make sure that the top and bottom teeth are aligned based on your occlusion and the teeth will be properly set. The dentist and patient will decide on the color and shape of the teeth. The lab will place the teeth on the base of the dentures and the patient will try them on. If you and your dentist are both satisfied then the denture will be fabricated. The process will usually take about 4 weeks. The denture will need to be adjusted to make sure that there is no heavy contact between the teeth and that the denture base is resting comfortably on the tissue. Your dentist will schedule a few follow up appointments as needed to make sure that even after receiving your denture, there are no sores or discomfort to make sure you are getting adjusted to your new set of dentures.